A new competitor to ClamWIn has arrived its called ClamAV for Windoz ! 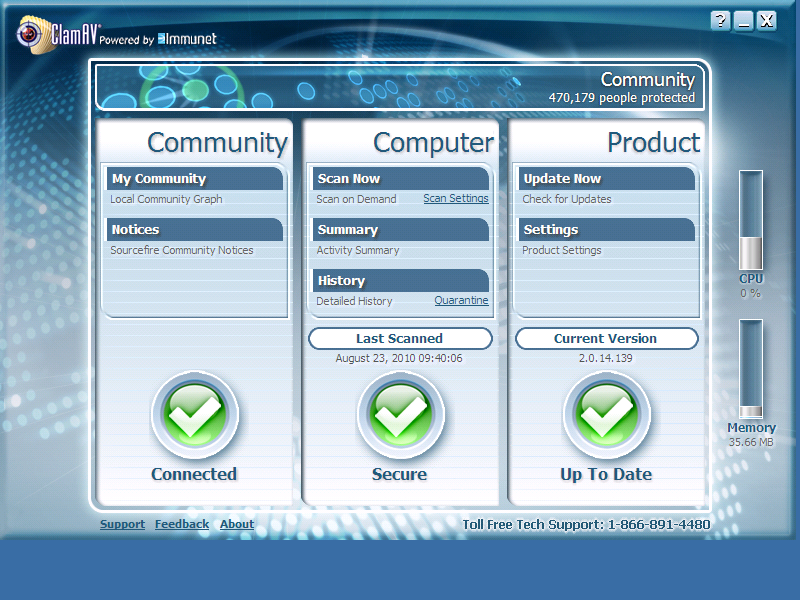 ClamAV for Windows 2.0 is produced by Immunet Corporation and Sourcefire, Inc.. It is designed to provide the ClamAV community with a Windows Anti-Virus (AV) solution incorporating all the standard desktop AV features one would expect from any commercial package. This includes; On Access scanning, On Demand scanning, Quarantine, and Removal. Additionally, it includes an innovative Cloud-Based protection engine, Community based protection, and companion mode protection features. This entry was posted in osde and tagged antivirus, clamav, cloud power, crowd power, windoz on 23/08/2010 by osde8info. You can try fixing NOKIA M$ Exchange Email unrecognised certificate problems with old mobiles (such as the E61i) by manually adding the missing Class 2 Certification Authority Root Certificate. For example if your M$ Exchange SSL certificate was bought from GoDaddy just open your NOKIA web browser and goto the GoDaddy Certificate Chain website and click on the DER Format CER certificate file ! This entry was posted in osde and tagged certificate, email, exchange, godaddy, howto, mobile, nokia, ssl on 16/08/2010 by osde8info. This entry was posted in osde and tagged embed, monitorus, widgets on 16/08/2010 by osde8info. This entry was posted in osde and tagged excel, m$, office, ooo, powerpoint, viewer, word on 16/08/2010 by osde8info.